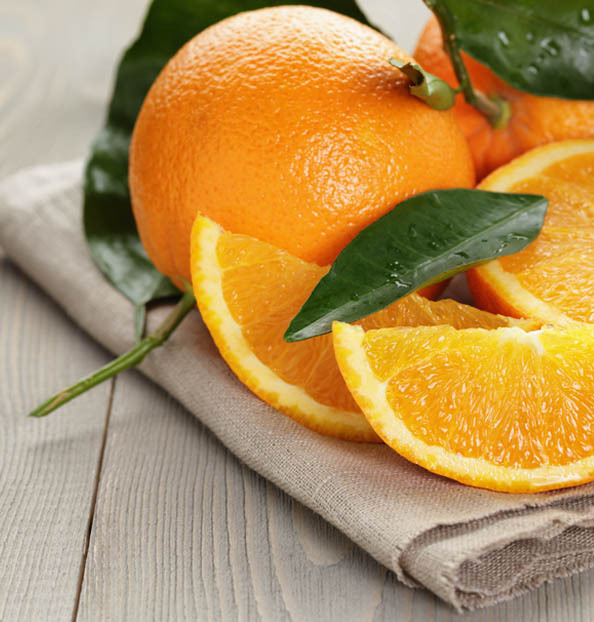 A large variety of navel oranges exist but the most important kinds are undoubtedly the navellina and the Washington navel. This orange variety’s perfect circular shape, slightly flattened on the ends, makes it the ultimate picture-perfect citrus fruit. However, what makes the navel orange stand out from the others is an undeveloped twin fruit held inside, which you can see for yourself when you cut it in half. The thickness of the peel can vary but the golden juice is sweet with acidic touches, making it perfect to make orange juice. Apparently the Navel or “Washington” orange derives from a spontaneous mutation which took place around 1820. Its average to large-sized fruit ripens from January onwards and may be harvested up until the end of February. This orange variety is less suitable for squeezing and generally eaten as fruit. It is characterized by the phenomenon of syncarpy, that is to say the growth of several fruits in one. A small, partially developed fruit lies in the apex of the primary fruit, forming a little button-shaped lump.